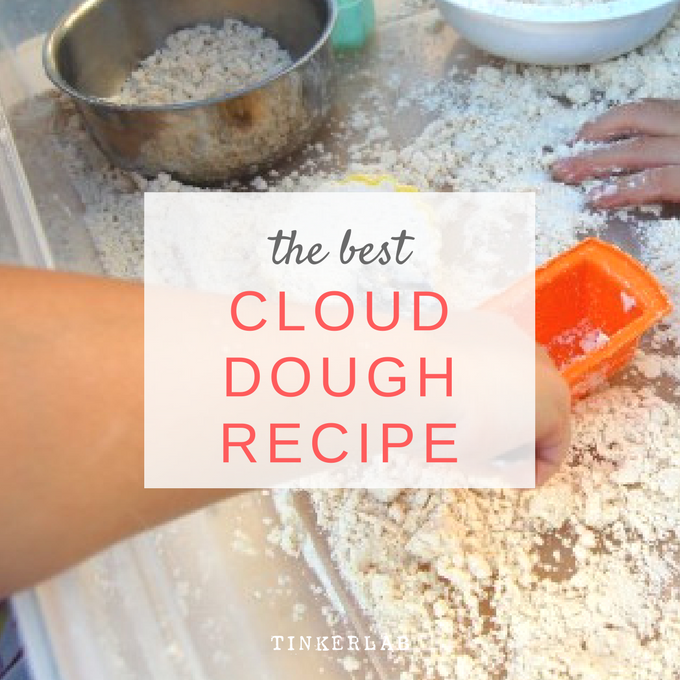 The only Cloud Dough Recipe you will need - just 2 ingredients! I saw this on Pinterest but wasn’t sure–since you’ve tried it, do you think it would work with rice flour? Amy~ With the cost of rice flour, I can see why you’re asking! I bet it would work. 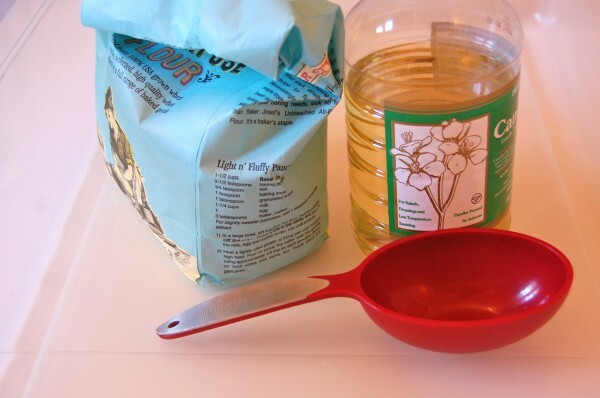 You could test it with 1 cup flour: 1/8 cup oil. But your question makes me want to give it a try. If you can wait, I’ll let you know!! Amy! I tried it today with rice flour, and it worked! The main difference is that the texture of the rice flour dough is grittier, so I’m not sure how much kids will enjoy playing with it. Will test that soon! We’ll have to try this, I’ve seen it around the blogging world but didn’t realize it would be so easy to make! I wonder if the texture is similar to Moon Dough? I’ve recently had the opportunity to play with some of that and the texture was so interesting I couldn’t stop touching it! I haven’t tried moon dough (although it’s also on my list), but the texture looked similar to me when I was looking at it too. 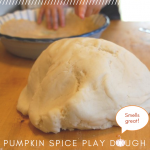 This dough really does feel like flour…with a little bit of stick. If you try it, please let me know what you think! It definitely has a wonderful texture, almost like Moon Dough but not the same. Moon Dough is very light, like it’s jet puffed or something. All of these doughs have such different, hard to explain textures, it’s a sensory overload for my hands! In a good way! Thanks for the inspiration to make cloud dough! Thanks for the link, Lori. It’s so nice to be included on your lovely blog! Messy, true, but I found that if it’s well-contained or used outside, it’s not too much of a problem. Look forward to reading about your experience with it, Ayn! 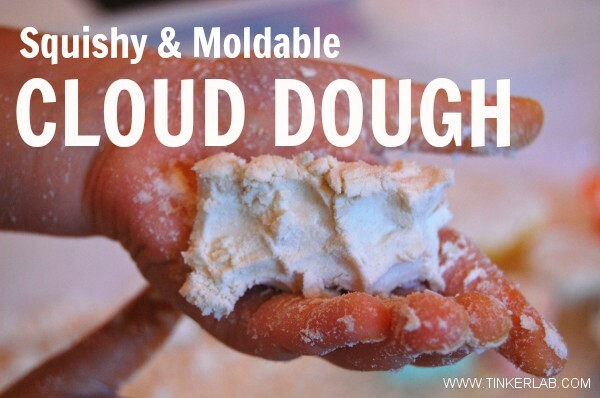 Wow this looks great – I saw cloud dough somewhere else and it looked soft and silky but not crumbley – was thinking of trying this this weekend and seeing what develops. It’s wonderful stuff, Cerys. I’d love to hear how it goes. Too fun! We like to do play-doh charades, but maybe cloud dough charades would be more fun! Play dough charades?! What is this? This looks like so much fun! I bed my little one would find it lot’s of fun and KNOW my big kids (one who is big on sensory stuff) would absolutely love it. Thanks for the great idea. Both of my kids enjoyed it, and hopefully you’ll have the same experience. Plus, it’s so easy to make that you almost can’t go wrong! enjoy. Thanks, Rashmie. No doubt you girls will enjoy it. Oh this sounds really cool! We’ll definitely be giving it a try soon. Very cool, I’ve never heard of this either, but after reading your post & seeing the pictures I am eager to try it!! 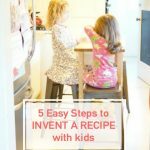 I shared it with my readers on Facebook (https://www.facebook.com/#!/pages/Living-Life-Intentionally/261252997248957) Thanks for linking up to TGIF Linky Party! I can’t wait to see what else you come up with!! thanks for the invite, Beth, and for sharing with your readers. cheers! What a fun idea! We just wrapped up a Cloud/ Water Cycle unit… this would be a great go-along! 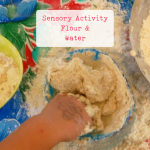 sounds like a fun sensory connection to your curriculum, kristina. hi emma! it can be messy, but it’s not the worst mess i’ve ever seen. imo, totally worth it! Where do you get your silicone molds? I picked those up at a Japanese dollar store called Daiso, but I’ve seen something similar at cooking stores like Sur la Table. Thanks for stopping by, Lara. Glad you saw it on Ohdeedoh — I love that site!! Thanks for the fun! Thanks for patrolling! I will need to take you to Costco for the jumbo bag. Haha! But where would I store it Oli?! 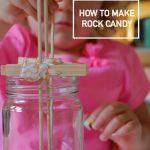 Hi, I loved this idea and tried it with my 3-year-old. We both had a lot of fun. I used baby oil, which smelt lovely, but found that the mixture was still pretty stocky at the 1:8 ratio. 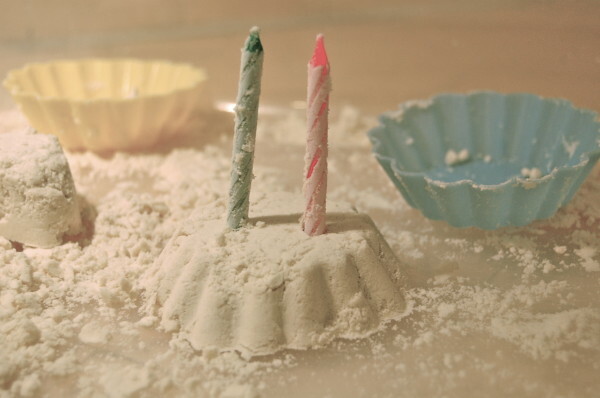 We added more flour and ended up more like 1:12 to get a texture like the Moon Sand (so it didn’t stick in the molds). Thanks for the feedback, Pippa. Isn’t that interesting that the baby oil combination would be so different!! It looks like they had a wonderful time cooking and creating! Curious – do kids come away with greasy hands? Not really, Tasterspoon. It’s kind of what you’d expect, but it actually reminded me of how your hands might feel after scrubbing with a sugar scrub. Soft and lightly lotioned? If you try it, let me know what you think. That was a great perk for me! My hands feel great after playing with it! I originally seen this on pinterest and I’ve been looking for an excuse to make it, when really, I shouldn’t need one! We’ll be doing this tonight. Thank you for sharing! Cloud dough saves the day! No school and a cold morning – needed something to entertain and my son is having a ball. Thanks! well doesn’t look like the pic worked! I’m so sorry, MW. Something has gone awry with my photo function. I really loved it and hope I can figure it out soon. Happy to hear cloud dough saved the day, though. Wow!! 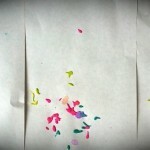 A question – my son was asking for colored cloud dough. 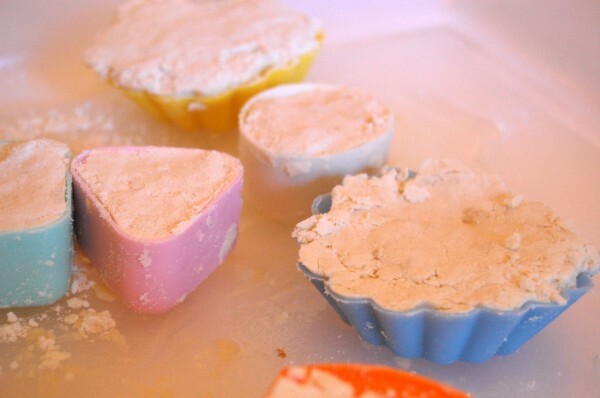 Have you ever mixed your flour and chalk experiment with this one and made colored dough? Or found another way to add color? I haven’t tried this, and think it could be worth experimenting with. Powdered tempera paint might be a good bet, but I’d be interested in trying liquid watercolors despite the fact that water and oil don’t mix. It would be interesting to see what would happen. 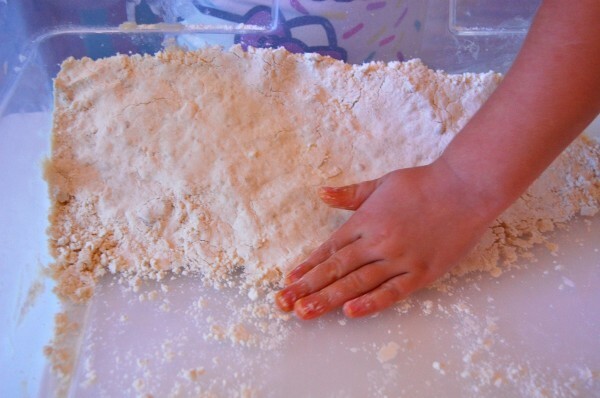 i’ve just come across this article, and we have used cloud dough with our preschoolers and our school agers-everyone loves it (except the cleaning staff, i’m sure). i did try to color it red for valentine’s day, using liquid water color, but i wasn’t very happy with the results. the color distributed very unevenly, with some very dark bits, but mostly very pale. i tried coloring only a small amount, just in case! I decorate cakes and makencandynso I had powder food colornon had. Itnworks great. We now have brown burgundey yellow green purple and pink. I just cut the recipe into quarters. 2 cups flour 1/4 cup oil. I mixed the Color into the flour then added the oil. Kids love it. Good luck and have fun. I’m curious as to how well this stores…can you put it away for another day, or does it spoil? I think a previous poster suggested using coconut oil for the longest shelf life, but I can’t say how it would work in the dough itself. I stored ours in a big ziploc bag, and hope it’ll store for a little while. Time will tell!! Did it store for very long? I was reading through the comments to find out. I have a 16 month old and sometimes her plans and my plans are different. I would hate for that to be the case and to lose all the cloud dough. I used ours about a month later and it was fine. I can’t say much beyond that because we made a mess of it, but I should really do some testing on the shelf life of it. You can expect it to last as long as oil will last once exposed to air. The oil will get that rancid smell and then it’s time to pitch it. I hate wasting things too, but since it’s just oil and flour, it may be worth giving it a go. I’d love to hear what your 16 month old thinks of it. Follow-up!! We just pulled out a bag of cloud dough that we stored for 6-months (and it hadn’t been used in between) — and it smelled great. The cloud dough is awesome. I’ve been trying to find a nice dough for some time that is similar to moon sand – this is as close as I’ve found. My kids 4 & 2 had a lot of fun. Thanks so much for sharing all your great ideas and activities. Just posted on Craft Gossip! Thanks for sharing! I made some of this for my preschoolers and they played for hours! I did a lesson on animal tracks. The children used their plastic animals to make tracks in the dough. Once they were done they wanted to keep playing so I let them and they wouldn’t stop 🙂 Clean up was a breeze. Thanks for sharing. Does this dry hard or does it stay soft? 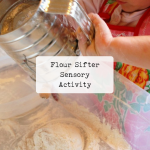 Love the idea!Â Doing winter theme the next two weeks with my 2’s… how much do you recommend I make for 5 kids at a time at the sensory bin? I’ve got to try this with my girls. Hi Cerys, Warm Snow would have also been a good name for this dough. I LOVE that — J may have a future in branding!! Awesome, Debbie! Thanks for your comment — it’s great to know that our projects are actually working and I love to hear about boys bulldozing the cloud dough. yay. My 5 year old is LOVING the cloud dough.Â I used baby oil and it smells divine.Â She has played with it everyday for a week.Â I have been storing it in a ziploc and it still looks and smells good.Â I thunk I will give it another week before I throw it out and let her make a new batch! I love getting notes like yours!! Thanks for making me smile. I’ll have to try it with baby oil next time – I’ve heard so many good things about it. Enjoy, enjoy!! We’ve just discovered that you can actually make building blocks out of cloud dough and build an igloo with it. Who knew flour and oil could be so versatile? Thanks for the idea. I did this today with my girls, 1 and 3, and it was GREAT fun! Thanks! I’m so glad I found this recipe.Â Moon sand is so expensive.Â What a great alternative.Â Thanks. Thanks for this great post! It was only about two minutes of set up… and about 45 minutes of non-stop involved play! My 3 and 5 year-old kids LOVED it. Needed something to keep 4 kids ages 4 – 9 busy without fighting. This totally did the trick! All four were completely engaged and happily playing together for over an hour! I have been asked daily to get the dough back out! Thanks so much for the idea! That’s amazing! There’s something very soothing and grounding about cloud dough and other sensory experiences. Very cool to hear that it appealed to such a wide age range. Thanks for the kind words, Crystal! My daughter’s preschool teacher saw this post, and in all his years of teaching had never seen cloud dough before. I wonder how this recipe gained a revival? I brought the project to her school, and it was amazing to see how well it went over in a large group setting. The kids were mesmerized. Thank you thank you thank you!!! This post introduced me to your blog which I now subscribe to, and I love it. 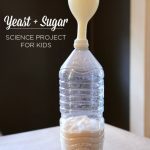 I have finally gotten around to making this, and my kids are loving it! My 4year old daughter just said “This is better than play dough,” then, ” This is keeping us REALLY busy!” Again, thank you! I love your 4-year old’s feedback with me!! Aside from sharing here, are you writing these things down? Thanks for the nice comment! Thank you!! My kids love this! I added some corn starch and a little more oil and it came out really moldable and smooth! Thanks for sharing! you’re welcome! and i love hearing about the additions to the recipe. 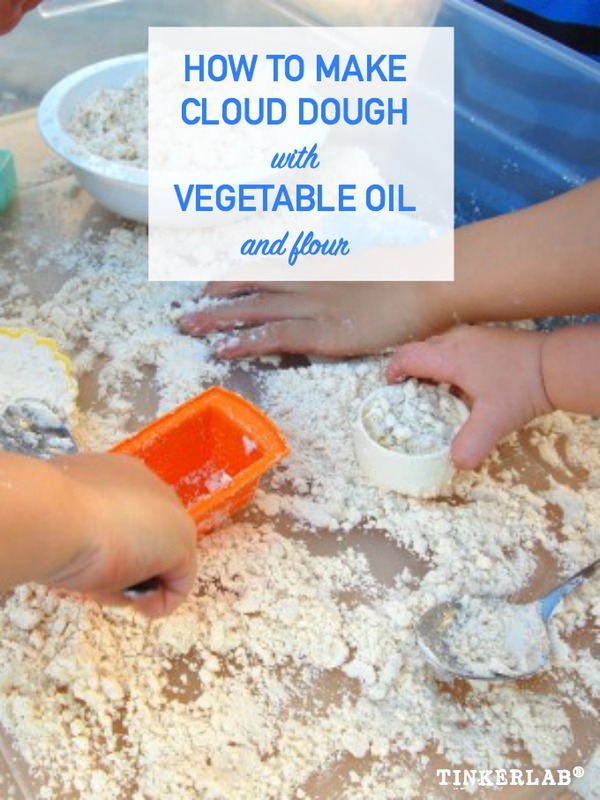 we’ll have to try that next time we make a batch of cloud dough! 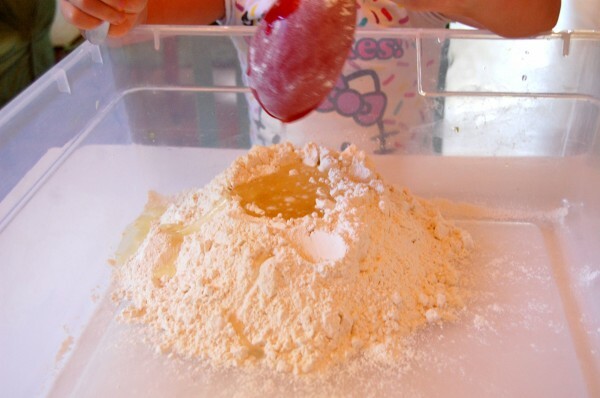 I’ve featured this activity in my latest Craftulate blog post on Larder Crafts for Toddlers. You’re welcome to see it here http://craftulate.blogspot.com/2013/02/30-larder-crafts-for-toddlers.html – please grab a Featured Button if you’d like to. Thanks for the inspiration! I came across this looking for some fine motor skills for my 5 year old who has had some fine motor development delay. I can’t thank you enough for how much he loves it….what I loved so much was once he made it he Saud mommy we need my trucks and graders to play with this stuff! Hi Penny! This is the best kind of comment. I especially love hearing that this dough was helpful to your son. I made a batch of this at my daughter’s preschool and there was one child who was mesmerized by the dough and could not leave the table. 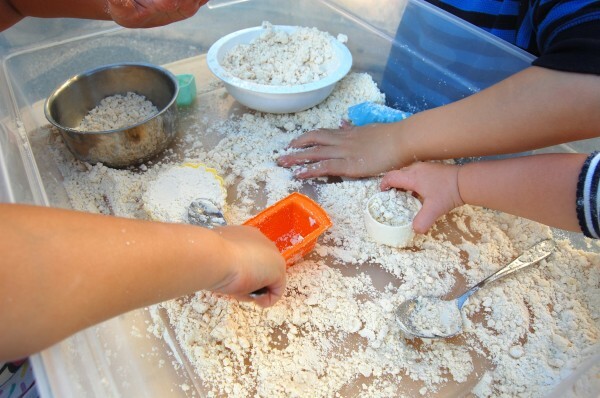 The teacher told me that he had sensory issues and couldn’t get near the sand box, and that the cloud dough was the first thing sand-like material that he expressed so much glee over. Thank you so much for taking time to send me this note. Just wanna ask how long can I use the 8:1 mixture before it spoils..I am surprised about this cloud dough and really excited to try it with my grandchildren..We’ll have lots of fun! Thanks for posting this! My mother stumbled across it on Facebook and shared it with me. When I did my grocery shopping the next day, I bought a cheap 500ml bottle of baby oil specifically to try it, and told my son (who’ll be 4 at the end of this month) that we’d make it the following day, which is today. Unfortunately, I’d forgotten to buy extra flour, as he was with me when I shopped, whereas he’s usually at preschool on shopping day, and he was trying to be in charge of my shopping list, which made me forget several things I had to buy! When we stopped at the supermarket again that evening, I forgot the flour AGAIN! However, I had a kilo bag of self-raising flour in the pantry, and figured the added raising agents wouldn’t affect the end result. Fortunately for me, I DID remember to pop into the dollar shop and buy a cheap 2.5 litre container to make and store it in. So, fast forward to this morning! We made it with 4 cups of flour and half a cup of baby oil. It worked perfectly and he loved it. I have quite an aversion to play-doh because it always ends up on the floor and carpet, which is something I can’t deal with, so this is an excellent alternative! Thanks so much for posting it in the first place! Our next adventure is going to involve making Moon Dough. I haven’t seen the recipe yet, although I’ve got it open in a separate window just waiting to be read, and I’m sure its going to be just as much fun. Before I do that, though, I think I’ll make a further 4 cups of the cloud dough with the remaining flour and baby oil whilst he’s having his afternoon nap! Sure wish I had some of these ideas about 40 years ago. I now have teen grandchildren! This might be fun for the teen who babysits… Also posted on my FB page for FB friends who have little ones. 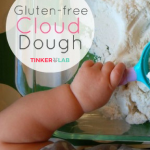 Just wondering how early (what age) you would recommend introducing cloud dough to a child? This would all depend on your child and personal comfort level. I introduced this to children in a preschool who were older than three. And in my home, my youngest was almost two when she first used it. The Cloud Dough that you are talking about, can this harden if left to air dry or baked? Thanks for sharing. No, it won’t harden as far as I can tell. I have just made this with my girls. We put sweet orange oil in ours and in smells divine. They are currently making a jolly good mess of the kitchen floor but loving it and son am I. One question: does it keep? I bet this smells amazing with sweet orange oil! Store it in an airtight container or bag and it will keep for a couple months, maybe longer. If the oil smells like it’s going bad, it’s time to make a new batch. Do you know the shelf life on this? I am wondering if its ok to make a batch and save half for a later time. Can’t wait to try it! Hi Lauren, It will last as long as the oil lasts. Basically, if it smells rancid, it’s too old. As for how long that will be, my guess is one-three months (the amount of time opened oil lasts before turning bad). Is Cloud Dough perishable? What is the shelf life?